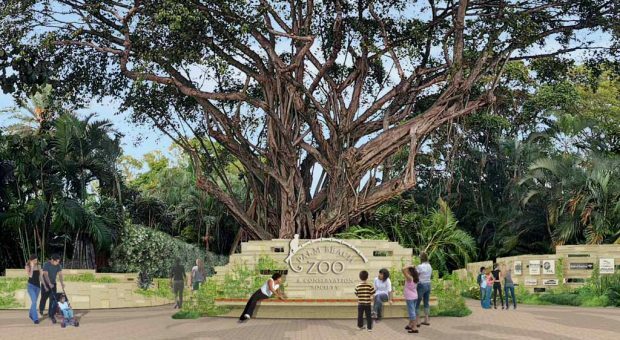 Michael Singer Studio has been working with Palm Beach Zoo and Conservation Society for a number of years on campus planning and collaborating on the re-design of its public spaces and infrastructure. While prior planning work has focused on programming and innovative solutions to water quality management, the recent focus of the Studio’s work has been on the planning, design, and sculptural fabrication for the new Palm Beach Zoo entry plaza. The new entry plaza is specifically designed to embody the Zoo’s values and conservation mission. The Zoo’s mission is “to inspire people to act on behalf of wildlife and the natural world” and also states “our commitment to sustainable business practices elevates our capacity to inspire others”. Sculpted walls, layers of vegetation, and a flowing aquatic water garden soften the edges of this new entry plaza to retain the intimate experience that is at the core of the Zoo’s identity. Over time the sculpted walls and water runnel will be partially covered in a blanket of climbing ficus, creating the feeling of something to be discovered emerging from the earth. The sculpted concrete created by the Studio for the entry walls and water garden is being locally cast with 100% recycled concrete aggregate. From the first entry point of the Zoo, guests will experience a new Florida Power and Light 100kW solar array shade structure covering a significant portion of the parking lot. The entry plaza itself is comprised of regionally manufactured permeable paving with recycled content; the plaza bollards are made from 100% recycled cast aluminum. Green roofs on top of the ticket booths will help keep the structures and surrounding area cooler and thus assist with energy efficiency as well as stormwater retention and filtration, and demonstrate a key strategy for urban wildlife habitat regeneration. The project also features reclaimed wood countertops, a rainwater harvesting system, energy efficient LED lighting, and a mix of native and tropical plants (irrigated in-part by the harvested rainwater). The new entry plaza is also expanded for accessibility and to accommodate school groups and large events like the ‘Brew at the Zoo’. The entry plaza will provide the more than 340,000 guests that visit the Zoo each year with a perfect start to their experience; messaging the Zoo’s commitment to environmental education and wildlife conservation. This project was made possible through generous support of Ruth and Ted Baum, Howard and Michele Kessler and the Florida Department of State, Division of Cultural Affairs. The full schematic design package can be seen here. General Contractor: Gast Construction Group Inc.